When we use the term "modern technology" we are typically talking about something from the last two to five years. Today I am going to be featuring a great new way to experience Walt Disney World that debuted in the last two weeks. There are many websites that display great pictures of the vacation kingdom, but now there is one that actually has theme park photos in 3D! I am speaking of Insidethemagic.net. It should come as no surprise that Ricky Brigante is the first to feature 3D theme park pictures on a website. He is obviously a big fan of modern technology and is the creator of the first Orlando based Walt Disney World and theme park podcast, which I wrote about in my very first blog article. In addition to his weekly Inside the Magic podcast, Ricky provides us with current theme park news through Twitter and Facebook. If you are a smart phone user, it is your duty as a Disney World fan to follow him on twitter.com/insidethemagic. It seems like anytime there is a change or update to a Central Florida theme park, Ricky is there to cover it. However, he has really outdone himself this time with the addition of amazing 3D photos to his website. 3D photography is not a new concept. There have been 3D movies made as far back as the 1950's. However, the availability of this technology in an affordable consumer product has been limited until recently. 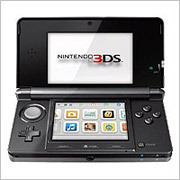 On March 27, 2011, the Nintendo company debuted an updated version of their widely popular DS portable game system. 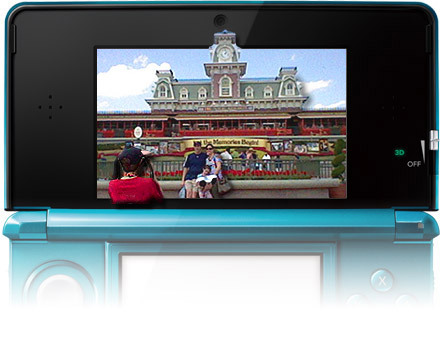 This new device, the Nintendo 3DS, is capable of producing 3D effects without the need for any special glasses. An equally impressive feature of the 3DS is the ability to actually take 3D photographs with its built in camera. Ricky Brigante must have been one of the very first Floridians to own a 3DS as he was posting 3D pictures to his website as early as March 31st! While the concept of looking at 3D pictures on a handheld device without using special glasses is intriguing, most of us didn't run out to purchase a Nintendo 3DS at $250. Thankfully, Ricky figured out a way to post the theme park pictures in several different formats. In addition to downloading them for the 3DS, we can also view them in the standard "red/blue" format right on our computers. As soon as I saw these pictures were posted at InsidetheMagic.net, I grabbed an old cardboard pair of 3D glasses and started viewing. To say that I was impressed would be an understatement! As of this writing, there are over 160 3D pictures available on InsidetheMagic.net. They can be found by clicking the "3D PICS" link at the top of that site or by visiting ThemeParksin3D.com to go directly to the page. 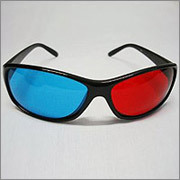 Also on this page you will find a link to order a decent pair of 3D glasses for about $5.00 from Amazon.com. I ordered mine and had them in under a week. They sure beat using the cardboard ones that typically come in video games or magazines. As soon as I saw the first batch of 3D pictures that Ricky posted on his site, I instantly knew that I would be writing an article on this topic. I look forward to the Inside the Magic podcast every week and certainly enjoy the info that he provides on Twitter and Facebook. If you are a fan of Disney World or any of the Central Florida theme parks, I highly recommend you check out InsidetheMagic.net. From the podcast to the high quality videos to the great new 3D photos, Ricky does a fantastic job of keeping us connected to our favorite vacation spot in a very informative and entertaining way.